√thumm (pronounced ROOT-THUMM) was born in Nara, Japan’ s first permanent capitol (celebrates its 1,300th anniversary in this year). An oriental-techno-pop 4-piece band with traditional Japanese melodies, techno sounds but not desktop music, live drums, live instruments, plus vintage synthesizers in rock band format, playing massive and fantastic live performances to show how special √thumm are. 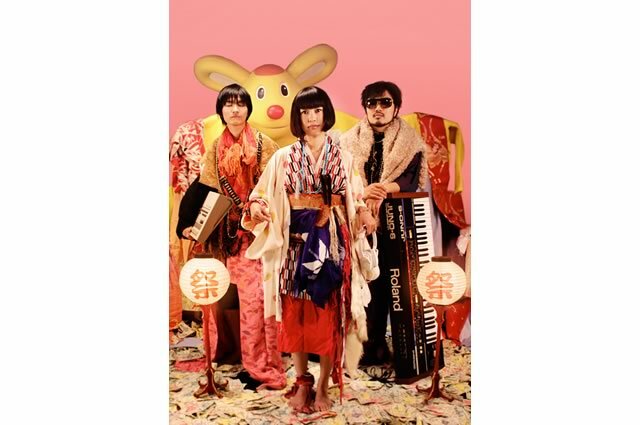 The trio takes plenty of inspiration from Perfume, Capsule and (the Japanese genre’ s father) Yellow Magic Orchestra while also adding a touch of rock to the electronic-heavy affair to craft 55-minutes of ear-pleasing music. “coton” serves as the big coming-out moment for a blossoming tech-pop-rock scene developing in Japan’ s Kansai region, boasting other young club-friendly groups like Bang Bang Balloon and Squash. It’ s a piece of gooey electro-pop stacked with killer choruses and feet-moving beats, one of 2009’ s best albums by one of Japan’ s most thrilling new bands. Also, noteworthy point of √thumm is Jappy. Jappy (Japan + Happy) is a drummer of √thumm, and the original character that created by Kyoto’ s artist group ANTENNA. Jappy makes Japan happy, Jappy makes everybody happy !! Finally, √thumm is the live band more than anything.